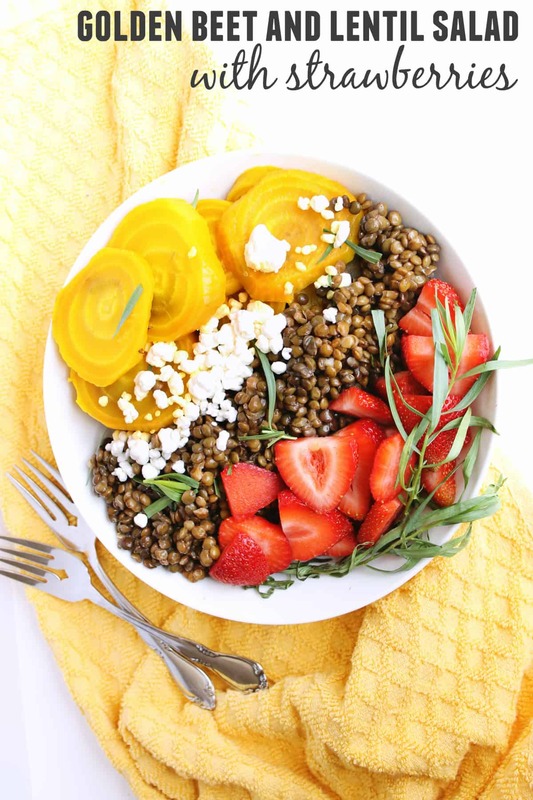 Roasted golden beet and lentil salad with strawberries is a delightful vegetarian meal! Super simple, super healthy, and super satisfying! Behold……… the STRAWBS! They are ruling my world right now you guys. I’m putting them in EVERYTHING, even savory concoctions. Get used to it friends. I’M CRAZY OBSESSED! The same thing happened last year. It’s like I forget about these red little sweet bombs until they start to show up in the Spring. Then, I’m just amazed all over again. You saw them in spicy salsa a few weeks ago, now you get them with some beets and lentils! Something happened last week that totally blew the lid off of my foodie life. I discovered that I have slightly high blood sugar nearing the 3rd trimester of my pregnancy. Apparently, it’s nothing to worry about, as long as I cut back a bit on the sugar and carbs. I guess my daily servings of raisin bran, potato chips, and ice cream have got to go. So, I’ve been trying to eat foods that are low on the glycemic index. Foods that won’t cause a crazy spike in blood sugar. Foods that won’t eventually lead to gestational diabetes. It’s definitely a bit tougher than I thought it would be. There are already so many restrictions on foods due to the pregnancy! I just found out that I can’t even have radishes due to the high possibility of listeria. OMG guys. So…….. here we are. A salad packed with fiber and protein, and low(ish) in sugar and carbs. Sweet, savory, salty, earthy, tangy, healthy, and totally delicious. SCORE! Preheat oven to 375 degrees F. Using your hands, rub the 1 tsp olive oil evenly over the beets. Wrap each beet in foil. Roast for 40 minutes, or until fork tender. Remove from heat and open foil packets to let beets cool slightly. Meanwhile, rinse lentils and remove any debris or pebbles. Place in a small saucepan and cover with water to about 1/2" above the lentils. Bring to a simmer, reduce heat to low, and simmer uncovered for about 30 minutes, or until lentils are cooked through, but still a bit al dente. You may need to add water to keep the lentils fully submerged while simmering. When fully cooked, strain out the excess water and set aside. When the beets have cooled enough to handle, remove from the foil packets and start to rub off the skin. * Slice the beets or cut into bite sized pieces. Combine the lentils, beets, strawberries, tarragon, and goat cheese in a large bowl. Combine the remaining 1 Tbsp olive oil and the white balsamic vinegar together and whisk to emulsify. ** Pour the dressing over the salad and toss until well combined. Season VERY generously with salt and pepper to taste. This salad can handle a lot of salt! *The skin should remove easily, but you might find the back of a knife helpful. **I like to combine in a small mason jar with tight fitting lid and shake to emulsify. Alright guys. Any tips for a preggo lady trying to avoid gestational diabetes??? I’d love to hear about your favorite low GI recipes! Oh my, this salad looks gorgeous! Sorry about your food restrictions, it must be tough to face! What other restrictions are there besides seafood and radishes? Hang in there! I knew about alcohol before but all the other restrictions you mentioned are totally new to me. I suppose you can live with it, but scones with coffee… Yeah, might be hard to resist! A combo I never would have thought to put together but of course it would be delish. How could you NOT want to make this after seeing these gorgeous photos?!? Yummy! I love the fresh and vibrant colors of this dish. I’ve never thought to add lentils as the base to a salad like this one but it looks delicious. Can’t wait to try! This is such a delicious combination of flavours! Oh gosh, what a great taste of spring and summer in a bowl. Those colors tough ! Gorgeous and i want to dive right in ! What a great recipe! The contrast in textures has to be amazing. I can’t wait to try this.. excellent new use for golden beets! Thank you so much Laura! I’ll check it out! This looks beautiful Trish! comfort food that is healthy too – yum! I’ve never made lentils myself, will have to try it! I have been trying to slowly work my way onto the beet train, and this looks really good! I love all the other flavors with this! Thanks Kim! I’m still trying to like red beets, but golden beets are so mild!